Welcome to Churn Pool Fishery, the home of exclusive Carp fishing in the Cotswold Water Park. Set in the heart of this beautiful area, Churn Pool is one of UK’s premier Carp fishing exclusive use venues. Picturesque and peaceful, it offers challenging fishing in lovely surroundings. With fish to over 40lb and lots of fast growing doubles, twenties and thirties, Churn Pool has a great mix of beautiful mirror and common Carp from a variety of strains. We are easily accessible from the M4 and M5 motorways and less than and hour and half from Bristol, Birmingham and London. If you have any questions, want to check availability or book, please call on 01285860783. First time visitor Gary Holland managed to get straight amongst the fish on his visit this week, with two mid 20’s on his first day. 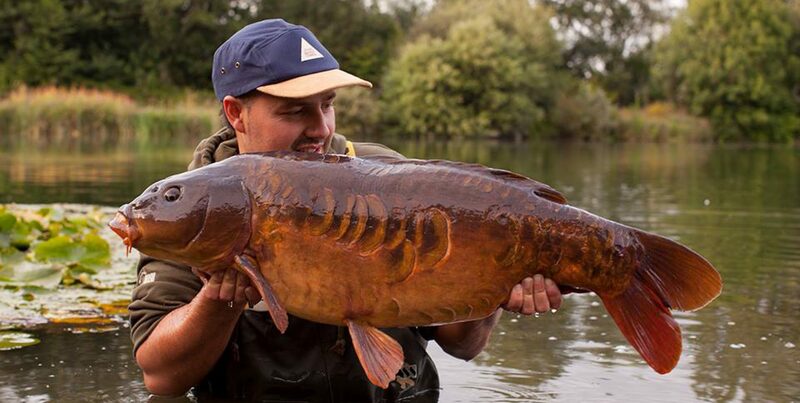 This beautiful fish above smashed his PB this morning, weighing in at a fantastic 40lb 7oz. Well done Gary, I’m sure a celebratory beer is in order! The trees are budding, birds singing and daylight hours noticeably increasing. Its a lovely time of the year to be out on the bank, and to help you make the most of it, here are a few tips to try and help you bag some springtime carp: Take a really good look around when you … Continue reading Spring tips! Best wishes to all of our customers and friends, past and present. As I write this on the 1st January, we are almost fully booked for the year, something of which I feel very proud. Most of our bookings (over 75%) are repeat visits, so I guess you all enjoyed yourselves! 2016 saw some … Continue reading Welcome to 2017!